Curves to Kill...: Dollbaby Tanks! Just a short post to share some great news with you. 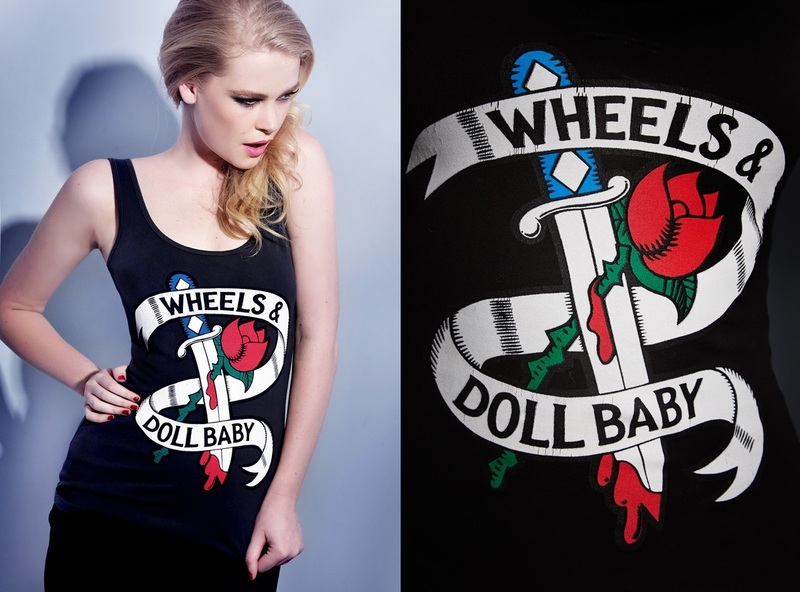 Wheels and Dollbaby have released their very popular tank tops/singlets for the amazingly affordable price of $59! Other than the great price point, they have now 3 of their most popular prints up to a size 16. This style is super comfortable, stretchy and fits down to the hip. With a fit much like that of the cupcake ruffle top, it will be the one hot item every curvy girl needs this summer. Easily paired with jeans or skirts, tucked or untucked, this tank is so easy to style! This is by far my favourite of all the Dollbaby logos and I love the Gretsch guitar featured within the print. The new mermaid logo is also available in black and how cute is she? I love the bikini garter tail combo, she's a saucy little lass. This print is a must have for summer and imagine how cute this will be with high waisted shorts and capris.﻿ So, all my size 14/16 Dollbabys, be sure to snap these 3 up on pre-order as they will be available and in high demand in early November. I think I need all 3 but that's only because they are so well priced and adorable.